Pectoral cross - A99LP (with chain) - Istok Church Supplies Corp. Orthodox Christian clergy pectoral cross with adornments of classical form is made of brass and covered with high-quality 24K gold-gilding. The cross is thick enough - 1 cm. The whole area of ? ?the cross, including the sides, is covered with floral ornamentation, large square stones of excellent quality are beautifully adorned with a cross and brightly shining in the light. The pendant is attached to the cross by means of a hinge, which makes the cross very comfortable when you wear it, the suspension does not turn over when the priest needs to raise his hand. 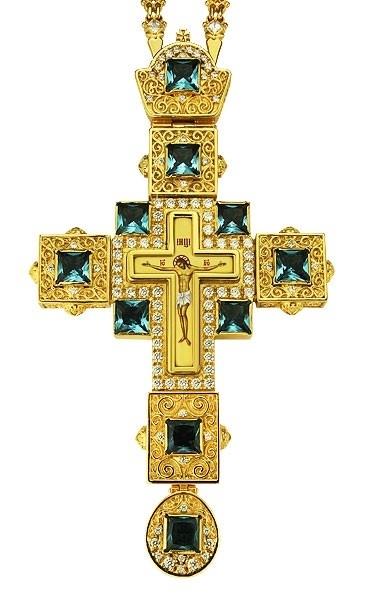 Especially it is necessary to note the quality of manufacturing of the central Crucifix, which is made using a special technology of applying a color image to the metal and covered with a special compound that makes it durable against mechanical damage and light. A scattering of small stones complements the design of the cross to perfection.